Today didn’t work out well. I could tell that this is the destiny that waits for me from the second I was awake. When the day finally ended, I sort f celebrated it by making myself a cup of coffee and listening to Jello Biafra’s spoken words. I like his anger, and I like his optimism and dedication, and sometimes it makes me feel the darkness that oozes through our world and manifests itself through society and culture. After about 20 minutes of immersing myself in his descriptions and stories, I added another album to listen to simultaneously with Biafra. 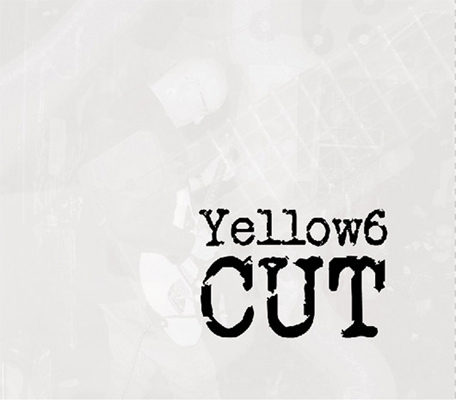 I added Yellow6’s album “Cut”. It was the fourth or the fifth time I have listened to “Cut” by Jon Attwood, Yellow6. On this time, with the addition of the sharp words I was already listening to, “Cut” seemed to enrich these spoken words in levels that surprised me. At first I was convinced that the stories I am listening to would overshadow the landscapes of Yellow6, but the opposite happened, and now I get to witness how powerful attwood’s music is, as it charges the meaning of all other sounds I am hearing right now with intense meanings. However, I will now focus on “Cut” alone, without any other musical help, as it deserves my full attention. The title track, “Cut”, opens the album with a painful, beautiful moment, which reminds me old tracks by Godspeed You Black Emperor! in its slow and emotional progress. On this track you can hear several guitars merging together and creating the gloomy composition, but on other parts of the album, drums by Dave Collingwood, as well as music by Beth Georgiou, which comes in addition to Attwood’s usual music which comes from his guitars. “Butterfly girl” continues the path that was started by the first track, and dives deeper into the musical melancholia, but Attwood is not here to depress, and he stores more surprises for later on. “Cut #3”, while sharing some elements with the first track, shows a certain change of direction, as moist clusters of optimism are found growing on the musical skeleton that remained from the first variation of “Cut”. “Gift”, in my opinion, is the most powerful track on the album. It is tense and unsettling, as haunting sounds follow the guitar playing, which is now more obscure than any other track on this album. The delicate guitar sounds are touching with their humble suggestions. This track is not glorious in any way, but it immerses the listener with the meditative, sad sounds that Attwood produces. Overall, “Cut” proves to be a sensitive album, as Attwood manages to express his musical decisions, be it through one delicate guitar, or through numerous layers of music that he combines together. Be it the simplistic approach or the more complicated one, the result is hypnotizing, making “Cut” a great album to listen to.